The purpose of this event is to provide support for our programming, have fun, and bring together all the great people who have supported our programs for the last 30 years. This includes our Summer Camp for Burn Injured Youth and Fire Safety Newspapers in Education Programs. Great People. Great Times. Supporting a FIRE SAFE and BURN FREE Wisconsin. 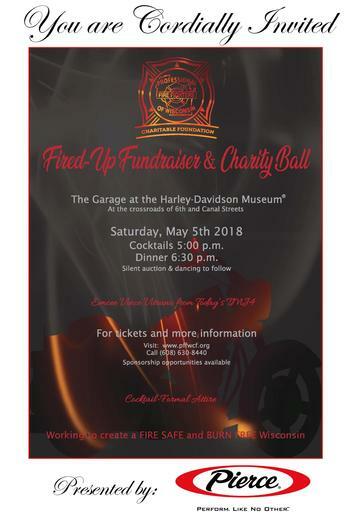 Please join in supporting our Fired-Up Fundraiser and Charity Ball presented by Pierce Manufacturing on May 5th, 2018. The event will be held at The Garage at the Harley-Davidson Museum® at the crossroads of 6th and Canal Streets in Milwaukee. The purpose of this event is to provide support for our programming, have fun, and bring together all the great people who have supported our programs for the last 30 years. This includes our Summer Camp for Burn Injured Youth, Fire Safety Newspapers in Education Programs, and more. Our supporters made a difference in the lives of thousands of young burn survivors and saved thousands more through fire safety education. Without them, we could not have made such a positive impact on the work we do to create a fire safe and burn-free Wisconsin. Please consider attending and supporting this event as a sponsor. Tickets are $75.00 each and sponsorship packages are still available, but both are selling fast. Purchase your tickets and sponsorship package now and reserve your place at this, unforgettable event and help us make a difference in the lives of the people we serve. The evening's emcee will be the Vince Vitrano from Today's WTMJ 4. Burn Survivors and alumni will share their stories, and how our PFFWCF programming changed their lives. Great people, silent auctions, raffles, games, and more will ensure that this unforgettable night of fun and excitement, will make a difference in the lives of many through support of this great cause. Name and logo on social media, signage, printed material, and other promotional items will commensurate with sponsorship level. VIP Reception will be a meet and greet with open bar cocktail hour before the event with the Board of Directors, Staff, and guests. Contact us to discuss Sponsorship Packages tailored to you. Donated items for raffle/auctions are also much appreciated. The dress code is cocktail formal and will take place inside The Garage at the Harley-Davidson Museum®. For more information or to purchase tickets or sponsorship packages, please visit our website www.pffwcf.org or contact us at (608) 630-8440 or Mike@pffwcf.org. Thank you for your time and consideration. We look forward to seeing you soon.